A week after demolition phases launched, one of the most significant investments to ever move forward on Atlanta’s burgeoning Howell Mill Road has netted a fourth tenant, officials announced today. Coworking company WeWork has inked a deal to open its sixth Atlanta location at The Interlock, an expected $450 million, multifaceted venture by S.J. Collins Enterprises where Howell Mill meets 14th Street. Called “WeWork Interlock,” the coworking hub will consume 180,000 square feet across three floors—enough room for 1,800 member desks, officials said. It’s expected to open in fall 2020, joining WeWork locations in Midtown and Buckhead and another that’s planned to debut next summer at Tech Square’s CODA. The Howell Mill corridor, however, has drawn heat recently for traffic issues and lack of momentum as it relates to a complete streets overhaul for non-vehicle mobility, as forecasted in the $250 million Renew Atlanta bond program approved by voters in 2015. It bodes well for the company that several hundred members could ostensibly live next door, at one of 350 apartments or 70 single-family homes in the works at The Interlock. Other components include 105,000 square feet of retail and a 145-key Marriott Tribute Portfolio hotel. 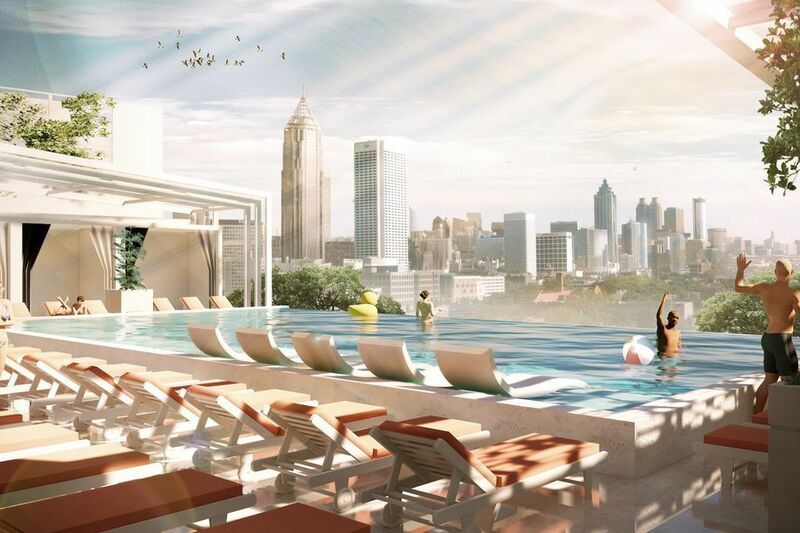 Above it all is planned a private rooftop pool club and lounge, plus a two-story restaurant. A planned rooftop infinity pool. In addition to WeWork and Slater Hospitality’s roof attractions, The Interlock has signed St. Germain French Bakery and Georgia Technology Ventures, which will operate a 50,000-square-foot incubator. The goal of the latter will be to promote and grow tech startups in the Southeast. Collectively, The Interlock is scheduled to open in summer 2020. Justin Latone, S.J. Collins Enterprises’s senior vice president of leasing, said his team has “very selective” in picking tenants.